It’s thanks to his winning of a major SciFest prize. OF ALL THE things that could happen in life, getting an asteroid named after you has to be one of the coolest. Lucky sixth-year student Christopher Carragher from Our Lady’s Secondary School in Castleblaney can say just that, after winning a major $1,500 prize in the US. 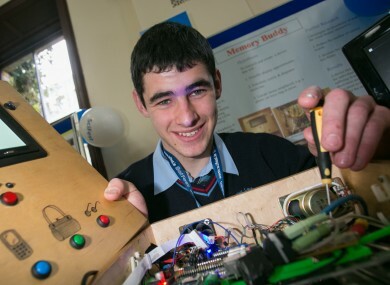 The Co Monaghan student had an asteroid named after him after he came second in the world award in the Computational Biology and Bioinformatics category at ISEF 2015 which was held in Pittsburgh, Pennsylvania this week. Carragher got to Pennsylvania after winning the SciFest 2014 national final last November. His project was about aiding people with memory loss. Around 1,700 students from over 75 countries compete at Intel ISEF for a prize fund totalling $4million. After becoming concerned about the signs of short-term memory loss in a family member, he decided to design an automated system called Memory Buddy. Memory Buddy uses Google Calender to alert the person about appointments and medication via flashing lights, sound and also via the TV. It also includes a remotely controlled medicine drawer to give the appropriate medicine at a specific time – there’s even a feedback facility to notify a carer when medicine has or has not been taken. An organiser for care rotas and appointments also comes with Memory Buddy. I met students from all over the world, and heard speeches from famous scientists like Nobel laureates Sir Harold W Kroto and Martin Chalfie. It’s been great to see all the projects that other students from around the world have been working on and it has been brilliant to spend a week together sharing our ideas. Sheila Porter of CEO of SciFest said that Christopher Carragher’s project “demonstrates that great science is characterised not by rote-learning and memorisation but by creativity and investigation”. Christopher was representing Ireland at ISEF and come second in the world in his category is an impressive achievement not only for him, his teacher and school but for Ireland too, and it is testament to the very high quality of science education in Ireland. To continue producing the highest calibre of science students in Ireland, we need to celebrate their achievements more, to promote inquiry based learning and encourage students to take their learning beyond the classroom. Email “This Irish student just got an asteroid named after him”. Feedback on “This Irish student just got an asteroid named after him”.